CD review: "A Christmas Celebration"
This review first appeared in the November 5, 1986 issue of The Daily Aztec. Halloween's over, and you know what that means  Christmas. Yep, soon that dumb Norelco commercial with Santa sledding on an electric razor will be on TV. Yeah, we know all about Thanksgiving, but that's just a break from Christmas shopping. Even as I write this, my good friend Woodstock is nursing a hellacious bruise sustained while battling a bevy of wild-eyed women in curlers at Woolworth's pre-Christmas sale. Where is all this leading? Why, Christmas music, of course. While the gang at KCR may be perfectly happy listening to the Meat Puppets during the Yule season, some of us prefere a more traditional approach. And Angel Records has released a dandy. 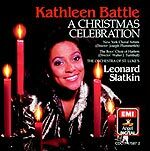 Soprano virtuoso Kathleen Battle, the emerging successor to Beverly Sills as America's diva, has decided to go for the green during the Christmas season. Everybody likes Christmas music, and it's not like there are new Christmas songs coming out all the time. Suffice to say that all the old faves are here, and Battle can sing. If you like the traditional stuff ("Oh Come, All Ye Faithful," "O Holy Night," "It Came Upon a Midnight Clear," "O Little Town of Bethlehem," etc. ), buy this album and sing along as you chug your spiked cider or egg nog. Just don't overdo it on the booze  nobody wants to hear you singing "Bring a torch, Annette Funicello."